I’m not going to lie - we’re still adjusting to the split custody arrangement. Daisy is at moments overcome by flashes of anger. Violet cries in anticipation of the next switch. On the nights I don’t have them, a passing siren can leave me sleepless for hours. I promise the kids it will get better, and they want to know when. I totally understand. I have to look back to where we were a year ago to see the progress. I try to imagine a year into the future and can’t. I would take uncertainty over stagnancy any day, but clearly, it’s time for new goals. For the better part of a year, my goals were all in the category of Stability: Step 1. What else is there when going through a divorce while moving, reorganizing a family, and starting a new job? But there was a subtle shift in July that seems to suggest when is now. I can’t help but associate this shift with our best dolphin sighting ever. During a walk on the beach at sunset last month, Violet had been complaining that it was not fair her older sister and dad had seen a dolphin the day before. Actually, she said it was “no fai-yeh.” She had tried and tried to see it too but never did and never had. She was taking it pretty hard. A few minutes later, I pointed out a school of dolphins swimming parallel to the coast. Violet was immediately flustered because she didn’t see them. Daisy claimed she could but was looking in the wrong direction. A baby dolphin jumped out of the water, I kid you not, and both girls missed it. We gave up, turning around to head back down the beach – and so did the dolphins. I made the girls stop and face them. The baby dolphin came flying out of the water again AND EVERY MEMBER OF OUR PARTY SAW THE WHOLE THING. Do you even know how rare that is? That memory was instantly golden. And it might have been a baby porpoise, so what. The girls and I are endlessly busy, and there is a list of people I need to call. I’ve lost a set of keys and haven’t been able to get to my mail for over a week. I missed a couple bills last month due to poor organization. And yet, the stress is somehow dialed back a bit. The kids are noticeably more relaxed and confident. There is healing where there were health issues. And that is why I’m starting to think about the future again as well as those philosophical questions that have no bearing on the daily grind, such as what I would do with my time if money wasn’t an issue (what would you do?). Interviewing seniors and writing about their lives came to mind. My 98-year-old grandmother’s health is declining, and she’s not as articulate as she once was. I wish I could have asked her more questions, but maybe she wouldn’t have felt comfortable answering them honestly. I wonder if it’s the type of sharing that’s best done with strangers. Imagine the history and wisdom waiting to be explored. Last night, I went to the visiting Picasso exhibit in the city with a friend. He pointed out something I would have missed - it was so simple and small next to the large graphic canvasses. 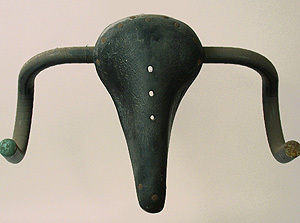 A bike seat with handlebars attached was mounted to the wall to resemble an animal skull with antlers. I have long been fascinated by art made of repurposed materials. It’s another pastime I would add to the list if time and money were abundant (as well as my own artistic ability). But on a more practical level, it’s a type of creativity that inspires me in daily life. I aspire to alter my perspective on life as it is, rather than wait for what the future might bring. pod. for some reason i cannot leave here without typing it. it's a compulsion. could be why i don't have many friends. senior stories sound great. but then, so does found object art. yes, you are so right. and apparently it's a bull skull with horns, not an animal skull with antlers. but if they were porpoises, then they would be a school. i'm just saying. I didn't know that! Learned something new. Off to look up more about porpoises. ok, but i was hoping to be the porpoise expert. you already have dolphins. i had no idea river dolphins existed. sadly, some are now extinct. very interesting stuff. not to make fun, but you used to draw uterus and fallopian tubes? oh no. before superpragmatic corrects me again, i better look up the plural of uterus. ha funny, no there were diagrams for health class that looked like this........fifth, sixth and seventh grade were big years for teaching us kids about our anatomy and the books and teacher drawings often ended up looking like this......the only time i spent drawing anything surrounding uterus(i?) would have been in some college science classes.....that's so funny I(!) knew what I meant! 'just didn't take the time to read the comment as others might...........oops! i don't know. that's a lot of explaining. you really don't have to be ashamed of your uteri-drawing past.